Snap Inc., the parent company formerly known as Snapchat just released its first earnings report since its IPO, and the results aren’t pretty. Snap missed analyst revenue estimates by $10 million, bringing in $149.6 million in revenue. And although Snapchat had a 36 percent jump in daily active users on a year over year basis, it added just eight million new users (five percent), from last quarter. As with Twitter, user and revenue growth are going to be important for Snap going forward. A five percent increase in new daily active users isn’t the kind of growth investors were looking for. At the time of this writing, the stock is tanking, and is down an astounding 25 percent in after hours trading. Oof. To be clear, Snap’s first earnings report as a public company is not great. That said, it’s not nearly as bad as some members of the press (who absolutely know better) would have you think. Snap reported a loss of $2.3 billion for the quarter, which is a HUGE amount of money. But don’t get it twisted, most of that loss was due to $2 billion the company had to pay out in stock-based compensation expenses. When adjusted for earnings before interest, tax, depreciation, and amortization (EBITDA), Snap lost $188 million for the quarter. In its first earnings call, Snap is already trying to move goal posts away from stuff like revenue and daily active users and onto “engagement.” This is a tactic that Twitter followers will be familiar with. Companies that tend to have massive user growth and growing revenue streams (Facebook) don’t tend to focus as much on how many “snaps” users look at. Another red flag for Snapchat? Nearly all of the company’s revenue comes from North America. Only fourteen percent of revenue came from outside North America. Also, if you were curious to see if Spectacles—the stupid glasses assholes like me waited in line to get—made Snap a lot of money, the answer was decidedly no. 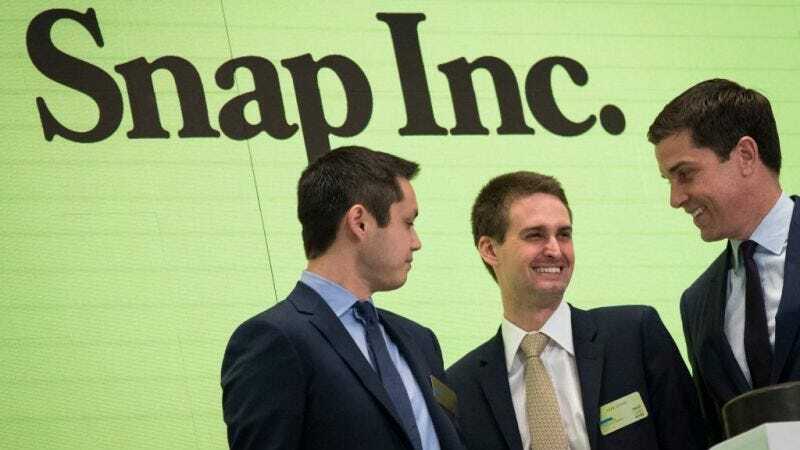 “They’ve achieved modest” revenue, Snap’s CFO said on the call. Back when Snap prepared to go public, we questioned whether the company would be on a trajectory more like Facebook or Groupon. I guess we have our answer.